Bellarmine defeated Valley Christian 75-61 last Friday night, with Bellarmine guard Jake Wojcik ’18 leading all scorers with 21 points and breaking the 1000-point mark in his varsity basketball career, a first in Bellarmine history. Bellarmine Head Coach Patrick Schneider elaborated on the accolade that Wojcik achieved. “He’s the first Bellarmine basketball player that I know of who has ever passed the 1000 point mark, so that was a really big deal, a really big thing. Everyone was really happy for him in the locker room,” he said. The first quarter was the strongest performance for the Bells, as they went on a 16-5 run. Kendall Stubblefield ’18 scored 3 baskets in the paint to spark an offensive push. They would lead the entire course of the game. Before the game could get out of hand in the second quarter, Valley Christian held on and scored a majority of their points early on from the free throw line. However, they shot 66.7% from the line, which was not enough to keep up with the fast-paced Bellarmine offense. Bellarmine entered the half ahead of Valley Christian with a score of 34-22 on a last-second layup by Jake Wojcik ’18, assisted by Nicky Fontes ‘19. One of the major issues that Coach Schneider looked to fix after the first half was allowing offensive rebounds, the reason for Valley Christian’s multiple trips to the free throw line. “We gave up 7 offensive rebounds in the first quarter. And that’s where you end up with fouls because you’re just kind of quick reacting with your back to the guy who got the rebound. So, once we cleaned up our rebounds we were much better with the foul situation,” he said. With time to regather their focus and elevate their game, Bellarmine started off with two easy fast-break layups by Connor Despie ’18. By the end of the third quarter, Bellarmine extended their lead to 20 points. 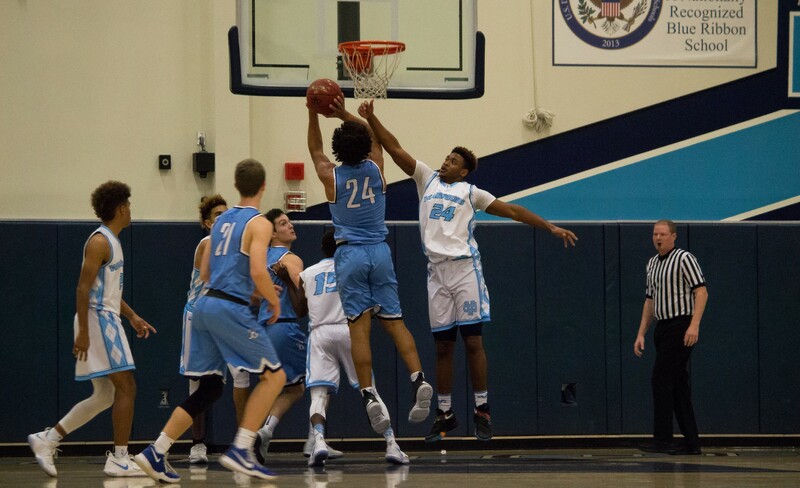 On the defensive end, the Bells locked down the paint, holding Valley Christian just to 11 points. By the fourth quarter, the deficit was too great for the Warriors to overcome, as the Bells cruised to their 12th victory of the season. Despite having a memorable performance, Wojcik rolled his ankle midway through the fourth quarter and was subbed out for the rest of the game. Coach Schneider gave a brief update after the team regrouped in the locker room. “With ankle rolls, you never really know until the next day or two so, he’ll go in and see the trainers [Saturday] and they’ll do a good assessment and see what’s happening. And we’ll find out on Monday at practice what the status is for Tuesday,” he said. Overall, Bellarmine has increased their win streak to 5 games. Coach Schneider mentioned how the team has been improving every game. “I think that we are growing on our level of performance. I thought tonight against Valley Christian we did much better at of moving the ball and finding open players, finding better shots, and taking better shots,” he said. Behind Jake Wojcik, three players reached 9 points, one of them being Quinn Denker ’20. Quinn believed ball movement was key to Friday night’s win. “We played really well sharing the ball. Our coach has this rule for us which is ‘3, 2, 1, pass’ and it’s been working really well and has been getting us open shots,” Denker said. “We just stick to the game plan. We also have great leaders like Kendall, Kirin, and Jake in the locker room who have contributed to our success,” he said. The Bells play this Friday against Archbishop Riordan at 7:30 p.m.